Blend mango pulp, powdered sugar and lime juice , whip it and keep it in the freezer. When it is half set,whip it again. In a bowl, whip the cream separately and fold it into the mango mixture. Place it again in the freezer for some time and whip it well. Repeat this process 2 to 3 times in a period of 2 hours. Yummy and delicious icecream, wish to have some scoops anytime. Ohhhhhh thankuuuuu dear..Its my fav tooo..
Bookmarked when I saw this in Tina's space,this looks perfect will try this. super cute :) & yum! 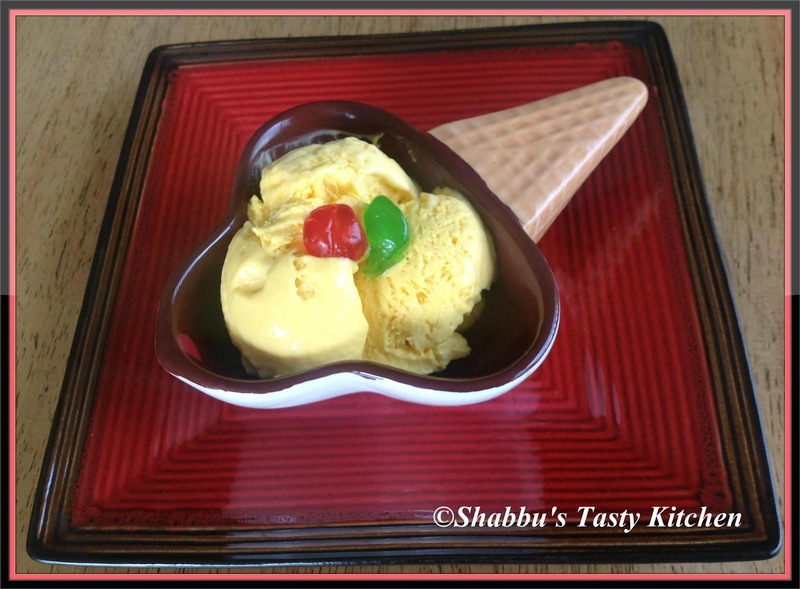 mango icecream looks so creamy n delicious...well made!! Very delicious n tempting ice cream !! mango ice cream looks delicious... perfect.. I'm new to yours space.Very nice recipes. After months it is sunny weather here and i wish i had this right now. The ice cream looks so perfect..tempting..have to try this one. Thanks for stopping by and really appreciate your valuable feedback. Just delicious...wish I could get a scoop now! I make it in the ice-cream maker ; this looks delicious!